U.S. forces in Najaf came under their most intense attack yet by Shiite militiamen in a clash Monday that may have killed up to 20 Iraqis. Meanwhile, Thomas Hamill - the Mississippi truck driver who escaped Iraqi kidnappers after three weeks in captivity - flew to Germany for a reunion with his wife. On Sunday, Hamill fled a house where he was being held north of Baghdad and ran to a passing U.S. patrol - his first appearance since his captors released a videotape April 10, a day after his abduction, threatening to kill him. Back in Najaf, the military still held back from going after the militia's leader, a radical cleric, to avoid angering Iraq's Shiite majority. Instead, the U.S. turned to a new commander for an Iraqi force taking control of Fallujah, considering Maj. Gen. Mohammed Latif - who opposed Saddam Hussein - to replace another general. In Baghdad, insurgents opened fire on U.S. soldiers guarding a weapons cache, killing one soldier and wounding two, the military said. Elsewhere, a Marine was killed in by enemy fire in Anbar province, the western Iraqi province where the turbulent cities of Ramadi and Fallujah are located. The deaths brought the U.S. toll to 153 since April 1 - including 15 in May. At least 755 U.S. troops have died in Iraq since the war began in March 2003. U.S. troops battling insurgents in west Baghdad pounded rebel positions with artillery fire Monday night, a series of eight or more heavy blasts that resounded through central Baghdad, the Army said. U.S. troops in Najaf, south of the capital, clashed for hours with Shiite militiamen who barraged the Americans' base with mortars overnight, then opened fire in the afternoon from several directions. Tank and machine-gun fire demolished a building that troops said was the source of shooting, raising a pillar of smoke. Apache attack helicopters circled but did not fire. Before dawn Monday, militiamen shelled the troops with about 20 mortars, hitting in and around the base where U.S. troops replaced Spanish forces a week ago. There were no casualties. The U.S. military is deployed at the base and outside Najaf to crack down on radical Shiite cleric Muqtada al-Sadr and his militia. But the troops have held back because the military fears angering Shiites Muslims, whose holiest site in Iraq - the Imam Ali Shrine - is about three miles from the U.S. base. Lt. Col. Pat White said American troops would "maintain our defense posture" until someone "much, much higher than me makes a different decision." He estimated 20 militiamen were killed in the battle and said there were few civilian casualties because troops were using precision fire. "I think every soldier here understands the sensitivities of the situation," he said. At a Najaf hospital, one slain Iraqi policeman and 16 wounded civilians were brought in, including a woman, who hospital officials said were hit by American fire. Razzaq Hussein, 22, a construction worker, was wounded by shrapnel from a shell he said was fired by the Americans. Al-Sadr's forces have stepped up attacks recently - apparently either to pressure U.S. officials to negotiate or goad troops into retaliating. On Saturday, al-Sadr's al-Mahdi Army militia attacked a military supply convoy outside the southern city of Amarah, killing two American soldiers. The U.S. military has vowed to capture or kill the cleric, whose militia launched an uprising across the south in early April. Al-Sadr, who is accused of involvement in the killing of a rival cleric, is in his office near the Imam Ali Shrine, making any move to capture him risky. Al-Sadr has sought negotiations through tribal mediators in Najaf but seeks a resolution that would avoid his arrest. U.S. officials insist he be brought to justice. Fallujah residents have been celebrating what many saw as a victory over U.S. forces as Marines pull back from their monthlong siege of the city and an Iraqi force - made up of former Saddam-era soldiers - moves in. U.S. officials have acknowledged they did not screen Iraqi commanders for their ties to Saddam before letting the brigade take over. The U.S. move to have Latif lead the Fallujah Brigade came amid complaints from some Iraqis that the current commander, Maj. Gen. Jassim Mohammed Saleh, a former member of Saddam's Republican Guard, may have been involved in past repression by the ousted regime. Hoshyar Zibari, Iraq's Kurdish foreign minister, said there were reports Saleh was involved in crushing the 1991 uprising by Kurds against Saddam's rule. Latif does "not have such problems" and at one point was imprisoned by Saddam, Zibari said. The U.S.-picked Governing Council warned against giving military posts to ex-generals involved in the former regime's crimes. Using officers who "participated in shedding the blood of the Iraq people ... especially Republican Guards, Saddam Fedayeen militia and the remains of the dead regime is strongly condemned," the council said. A senior U.S. military official, speaking on condition of anonymity, said Latif would likely step in as commander, once he is vetted, while Saleh may take a junior position. U.S. officials have acknowledged they did not fully check out the leaders and members of the new brigade to see how close their ties were to Saddam's regime - a sign of the military's eagerness to find an "Iraqi solution" to the siege, which prompted an international outcry and strained ties with Iraqi leaders. The new brigade has taken up positions around southern Fallujah and is due to replace Marines on the northern side and start patrols in the city soon. 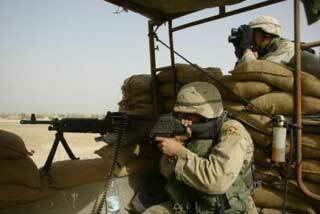 U.S. officials say the Fallujah Brigade will crack down on guerrillas - although the force is likely to include some of the gunmen who last month fought the Marines. Since Friday, insurgents have moved freely in Fallujah, sometimes standing alongside Iraqi police. Will the new national flag fly?